PÓG MO THÓIN Irish shot glass features a suggestive leprechaun. The phrase PÓG MO THÓIN is Gaelic for kiss my arse. 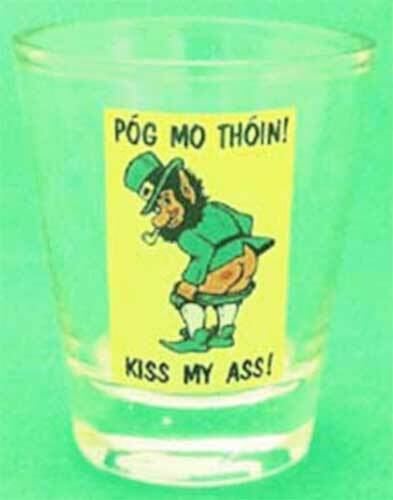 This Irish shot glass, with a naughty leprechaun, includes the words PÓG MO THÓIN. The leprechaun shot glass measures 2 1/4" tall and hold 2 ounces of whiskey. The colorful shot glass from The Irish Gift House is gift boxed and made in Ireland by Liffey Artefacts. Irish shot glass set features pewter emblems with the iconic shamrock, Ireland's most celebrated symbol. Irish shot glass features doctor's orders along with a shamrock.